Buck's Naked BBQ came to fill the space left open by Havana South on Wharf St. in Portland's Old Port. 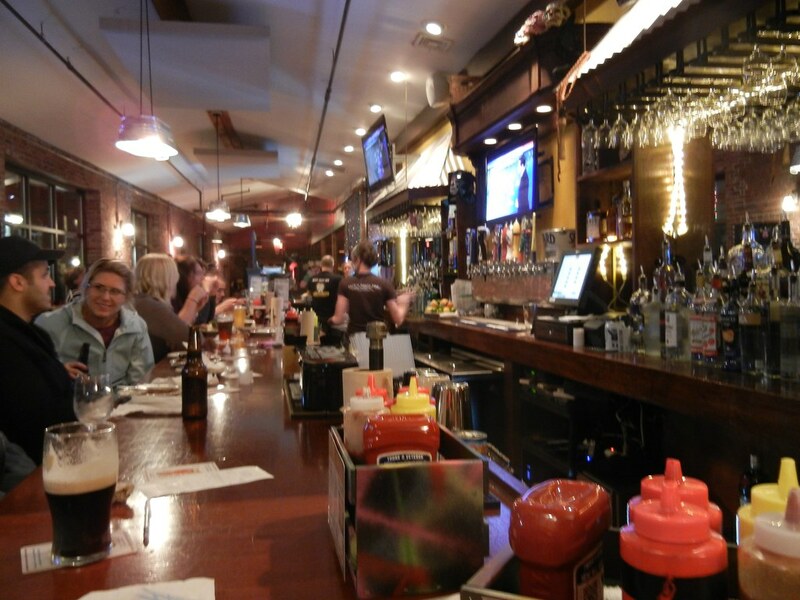 While I didn't enjoy eating at Havana, I did enjoy their bar space. So I was happy to see a place like Buck's take over, figuring that the well established, mass appeal of their BBQ has what it takes to fill the cavernous space. 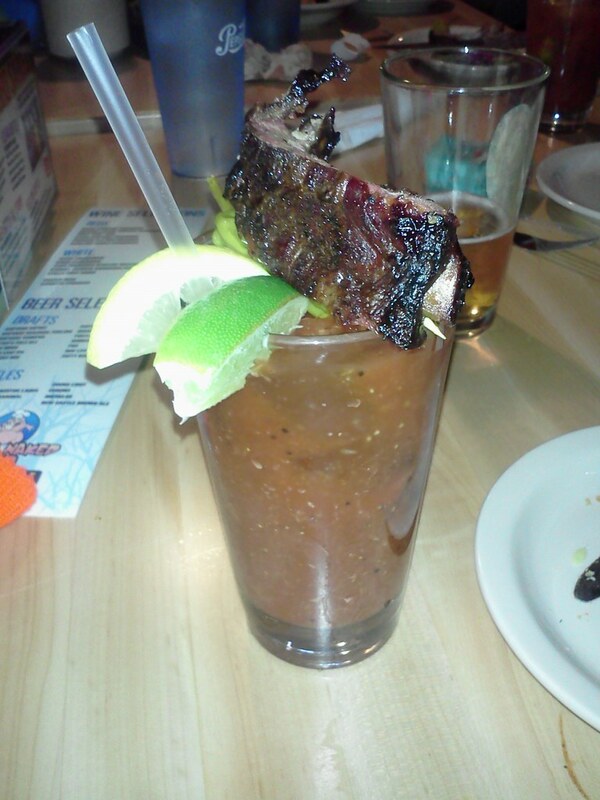 Recently, I met some friends for dinner at Buck's, and a Bloody Mary (dubbed a Bloody Buck here), even though these are usually brunch drinks to me. I was urged to order one because the drink comes topped with a rib. Unfortunately, I wasn't impressed by this novelty, and the appeal of the thick tomato drink was lost on me after dark. Buck's does offer a wide draught beer selection, and I moved on to Portland Lager. 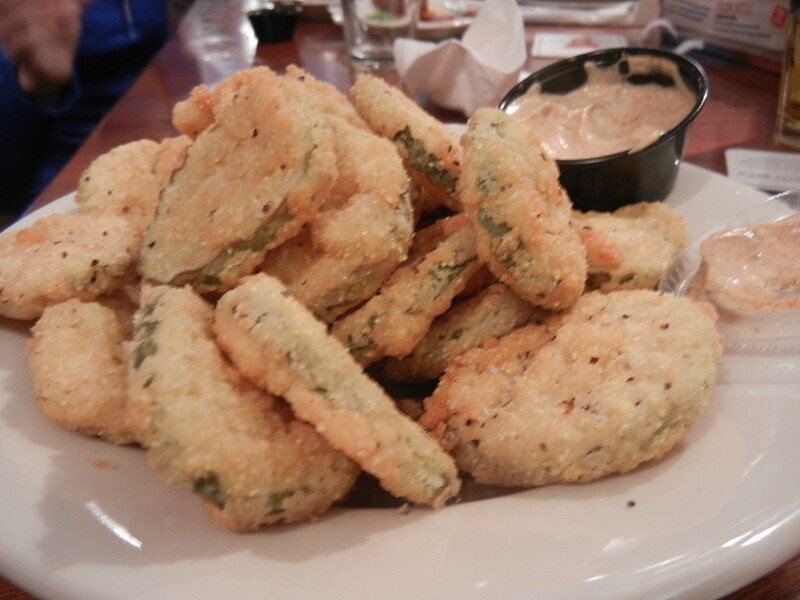 A fried pickles appetizer ($7.99) always draws me in, and Buck's version has thick chips coated in a cornmeal batter. The thickness of the pickles and the breading prevents the snack from being greasy, and I think this version is at the top of the list of those around town. I hear the wings at Buck's are "better than Binga's" (I'm skeptical), and can be ordered so hot you're required to sign a waiver before digging in. The rib sampler (4 for $8.99) and the pulled pork sandwich ($7.99 with one side) offered mix of the BBQ styles available at Buck's - both are smoked with a dry rub and served "naked," or without sauce. The saucing options are a South Carolina style, mustard sauce, a North Carolina tomato-vinegar sauce, a sweet, thick Kansas City sauce, and a blueberry sauce. 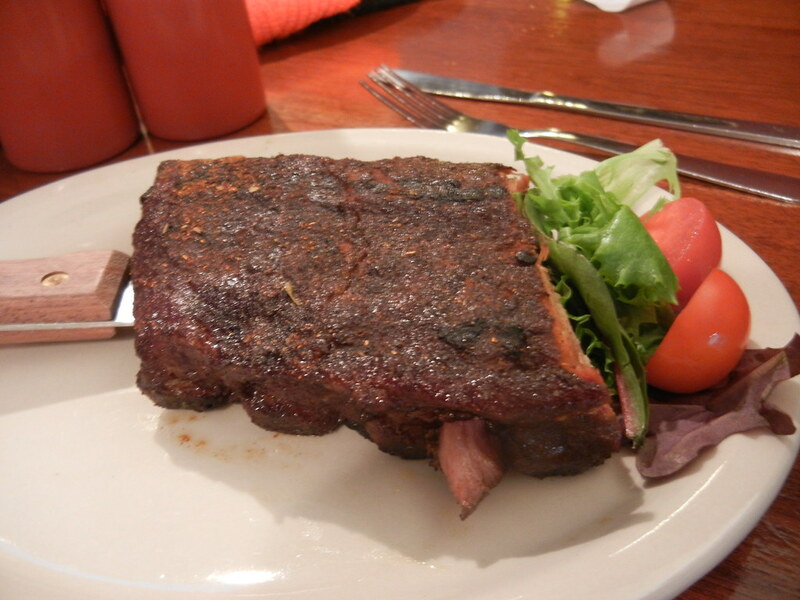 The ribs were good, tender and meaty with plenty of spice and heat in the rub. The pulled pork sandwich fell short of excellent. I think the naked style fails here with the meat being too dry, then having to coat the sandwich with sauce to the point of saturation. 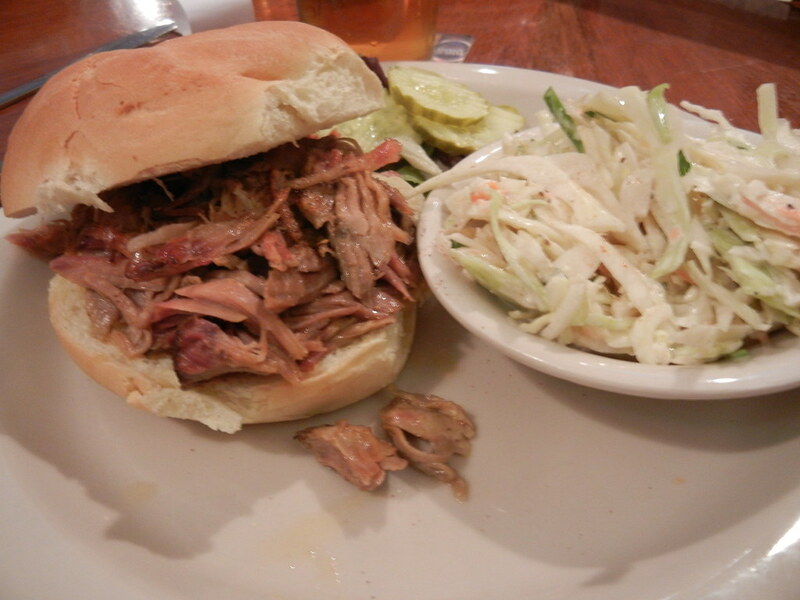 The meat portion was small, and I'd prefer to have fries and slaw with my sandwich rather than one or the other. Being no expert in barbecue, I can't begin to wade into whether this is authentic or how it rates compared to other regions. I can only tell you what I like, and I won't order the pulled pork here again (one of my favorite pit sandwiches), but enjoyed the ribs. But the menu at Buck's veers far from barbecue (falafel sandwiches, fried shrimp platters, steak and cheese sandwiches), so there is something for everyone. The fried catfish sandwich I tried during another visit was excellent. The roadhouse vibe isn't as pervasive as it is in other Buck's locations, and with plenty of seating in the bar, I'm sure I'll find myself visiting again to try their wings and order some drinks (sans the rib topper though). Sauerkraut to break up all the holiday cookie recipes - you didn't see that coming, did ya? I made a batch of pistachio brittle and this sauerkraut in one evening. I felt very accomplished. I used my mandolin slicer to thinly slice a medium-sized head of green cabbage into a large bowl. I then sprinkled it with canning and pickling salt (Kosher salt works too, just avoid anything that is iodized), and massaged it until it looked bruised and was juicy. I sprinkled in whole peppercorns and celery seed. I would have also like to add caraway or dill seed. 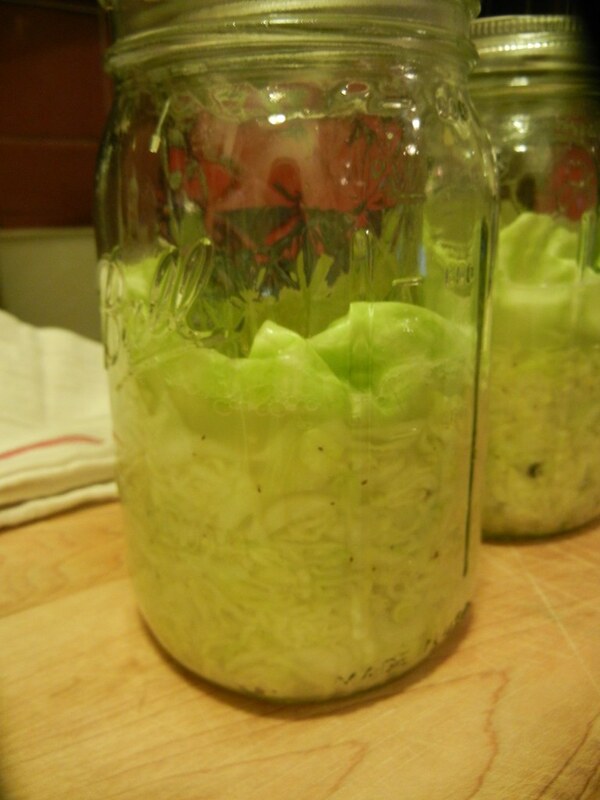 I then packed it tightly into two clean wide-mouth quart jars, and covered it with a whole cabbage leaf. Maybe this is more aesthetic than practical, since I definitely like the look. But the whole leaf helps to keep all the shreds under the liquid too. Everything is weighted down with a jelly jar that is filled with water and pressed into the quart jar. I covered the jars with some muslin cloth and put them in the corner where the heat pipe (usually inconveniently) runs through my pantry cabinet. I'll wait a few days to taste it and then move it to the fridge, where it will last for a few months. We had our 4th Annual (!!!) Obscure Holiday Cocktail Tasting last Friday. The cocktails we served are obscure in that they're original and unique, rather than obscure as in lost to history. We're embracing this evolution and even floated the idea that next year all cocktails should be original. After reviewing past cocktail party write-ups, I realized that I needed to pull my weight this year. So I worked hard to make a delicious cocktail that used as many local ingredients as possible. 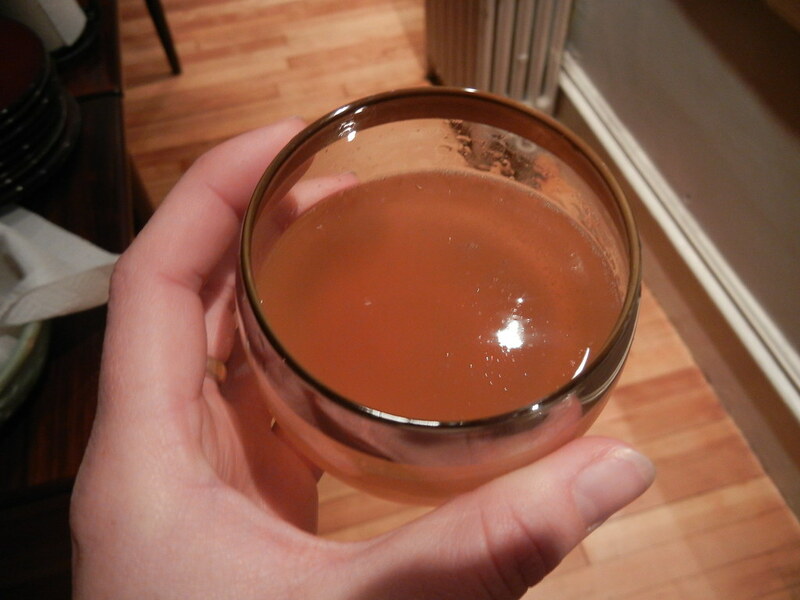 My cocktail, the Stone Rose, was a spiced, fizzy apple cider-esque cocktail. 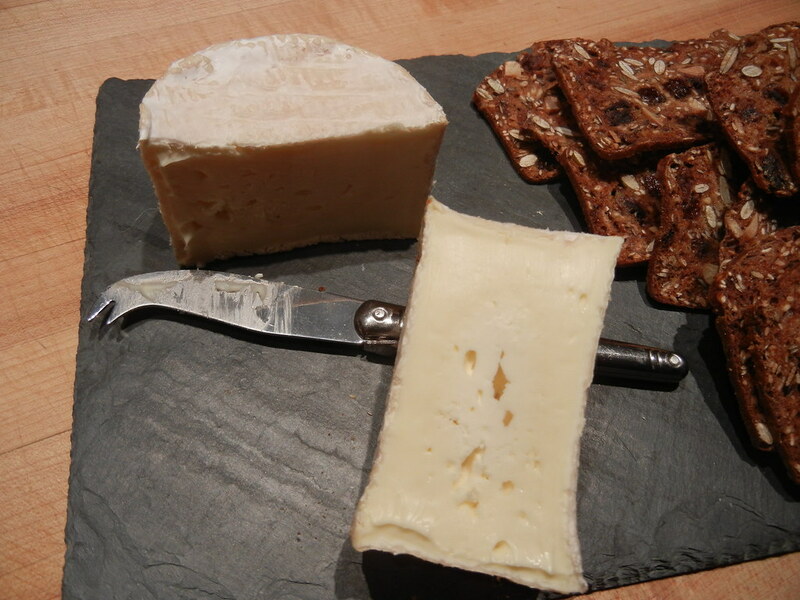 It paired well with the creamy Lady Laurier cheese, a Triple Creme Brie. Do ahead: Dice 1 tablespoon of fresh ginger. Wrap 1/2 a cinnamon stick, 2 cardamom pods in a kitchen towel, and smash them with a heavy pan. In a small saucepan, combine 1/2 cup honey and 1/2 cup water. Add ginger and spices. Bring to a boil; reduce heat and simmer for 15 minutes, until syrup is dark and spices are fragrant. Remove from heat; let stand for 4 hours. Strain. Combine all ingredients, except sparkling wine, in a cocktail shaker filled with ice. Shake and strain into glasses. Add sparkling wine. Next, Dawn of Appetite Portland made the Admiral Yamamoto, a smoky, sweet/bitter cocktail that she had on a recent trip to San Francisco. 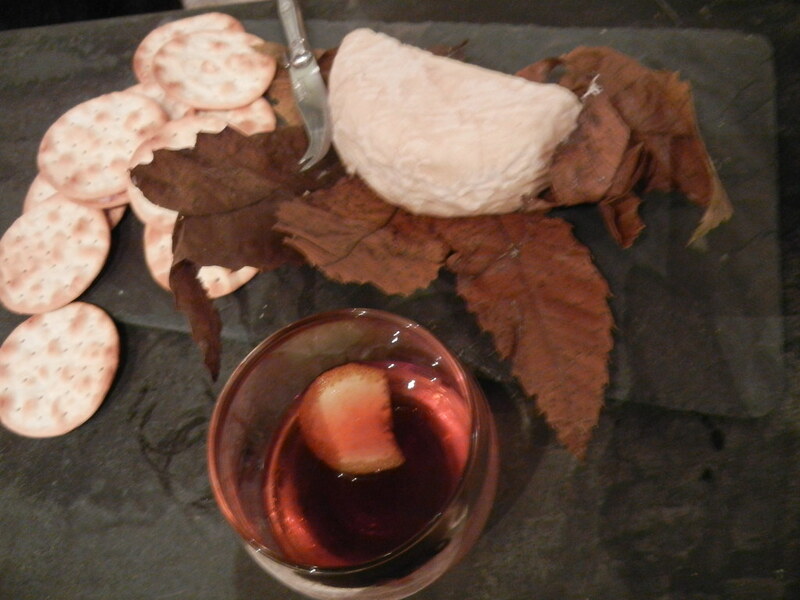 The cheese pairing was a Robiola de capra, a goat's milk cheese aged in chestnut leaves. 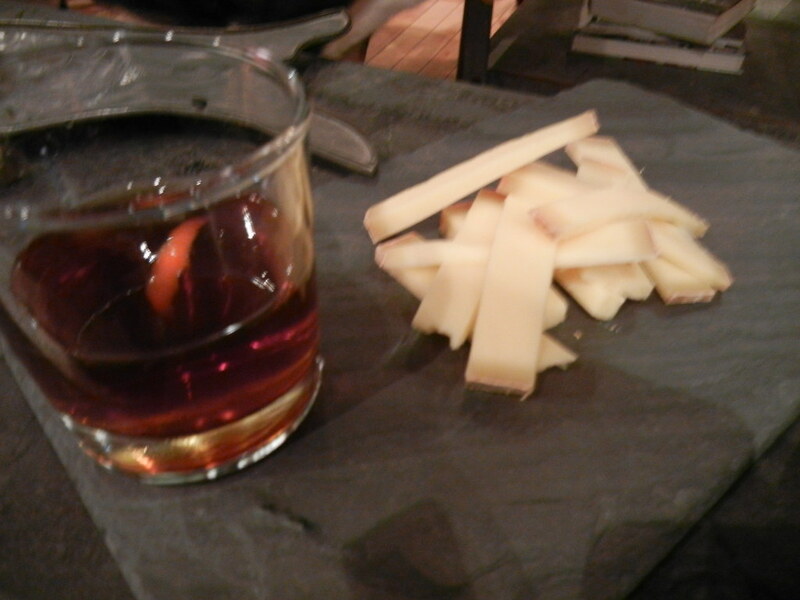 The presentation is beautiful, and the cheese emphasized the sweet notes of the drink. Combine all ingredients in a cocktail shaker full of ice. Shake. "Wash" a martini glass with a splash of Laphroig single-malt scotch. Pour cocktail into martini glass. Then, put flame to an orange peel to slight smoke. Add to drink. Anestes of Portland Food Map told the epic tale of building his cocktail around Speckled Ax's ice brewed coffee extract. After trying many liquors and consulting Hugo's bartenders, he settled on a blend of Single Barrel Jack Daniels, Eden Ice Cider, coffee extract, and walnut bitters. The result was warm, sweet, and nutty. Shake, strain, and serve with an orange twist. This drink was paired with Tarentaise from Spring Brook Farm in Vermont. This raw milk's cow cheese was so spicy that many of us silently debated whether we were having an allergic reaction before someone spoke up. 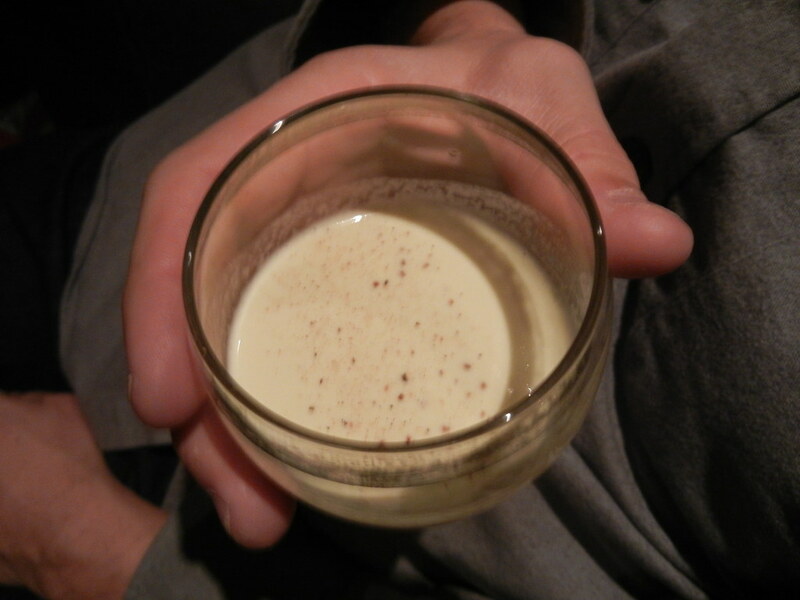 Adam did what I had tried to do for two years past - make a decent egg nog. He, of course, turned it up to 11 by infusing his own pine nut and spruce vodkas. Hm, seems we're short on the exact details, but you get the idea. 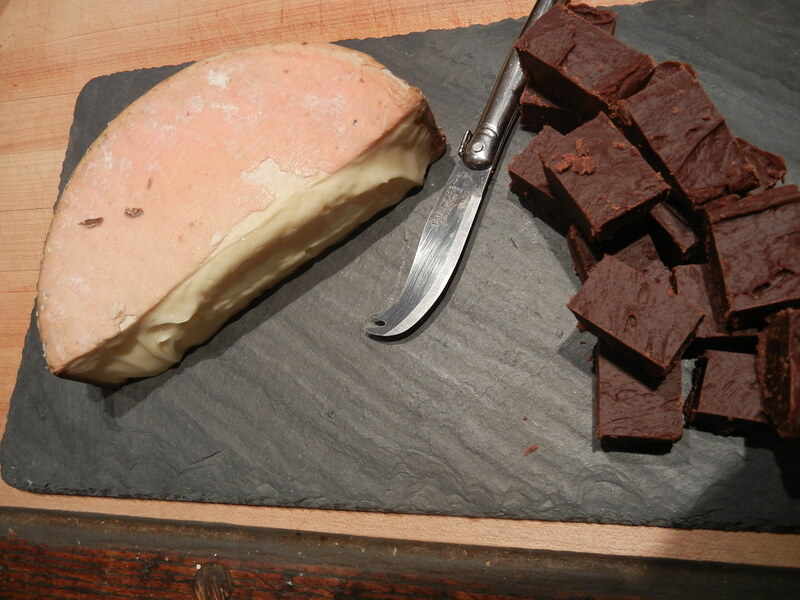 The cheese pairing of Winnimere, a washed-rind, aged cow's milk cheese wrapped in birch bark was great, with some fudge to cut the richness of the dairy. I'd be remiss if I didn't also mention that Vrylena and Dave brought an awesome pomegranate seed, walnut, scallion, and parsley salad. Many thanks to Shannon of Edible Obsessions for bringing the delicious cheese, crackers, and fudge delights. This cocktail party gets better and better every year, and I'm so glad to have shared another year with the fantastic friends that I've met through this blog! Here's the poutine served at Ruski's. If you've been to Ruski's before, you should know what to expect - brown gravy from a packet, melted mild cheese, crispy from-the-freezer fries. All good! There is a time and place for everything. But this is stick-to-your-ribs, drink-6-Miller-High-Lifes (only $2!) poutine. 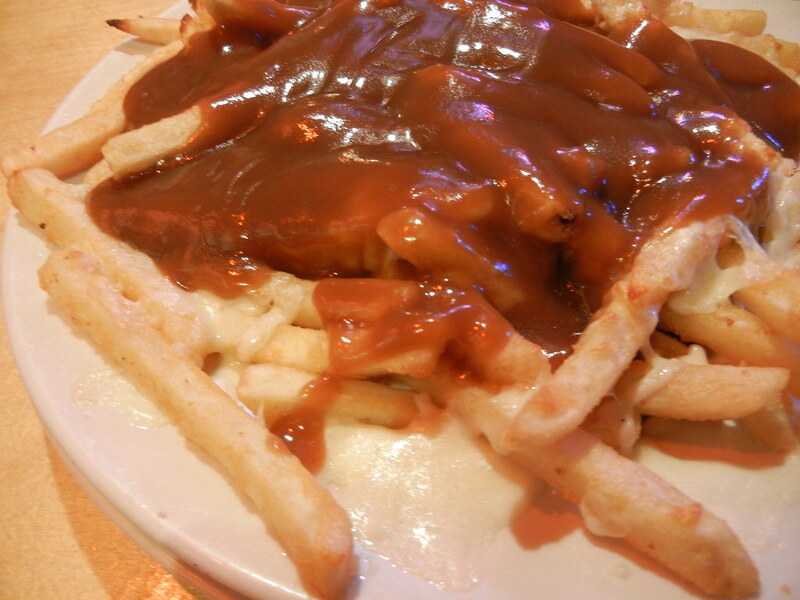 Or rather, just 'gravy cheese fries.' It might not even be classy enough to be French-Canadian. Delicious though. Regardless, some of these ladies are Bears fans, so oddly enough, our cookie swap happened at the Asylum Sports Bar. Made funnier since Vrylena is pregnant, so obviously doesn't drink. But I was headed to Binga's afterwards for the Ravens game (no comment), so I was more than happy to share the company of some football fans all afternoon. Russian Tea Cakes are also apparently known as Mexican/Italian Wedding Cookies and are small, shortbread-type rounds with pecans inside, and dusted in powdered sugar. I also made Haystack Cookies, which my Grandma used to make (she's still alive, she just stopped making these cookies) and bring when she visited at the holidays. They're sweet, salty, and crunchy, like chocolate covered pretzles. Many options for variations abound. Do you swap cookies with friends? I admit I first thought it sounded needlessly fussy, but it was easy and very fun. 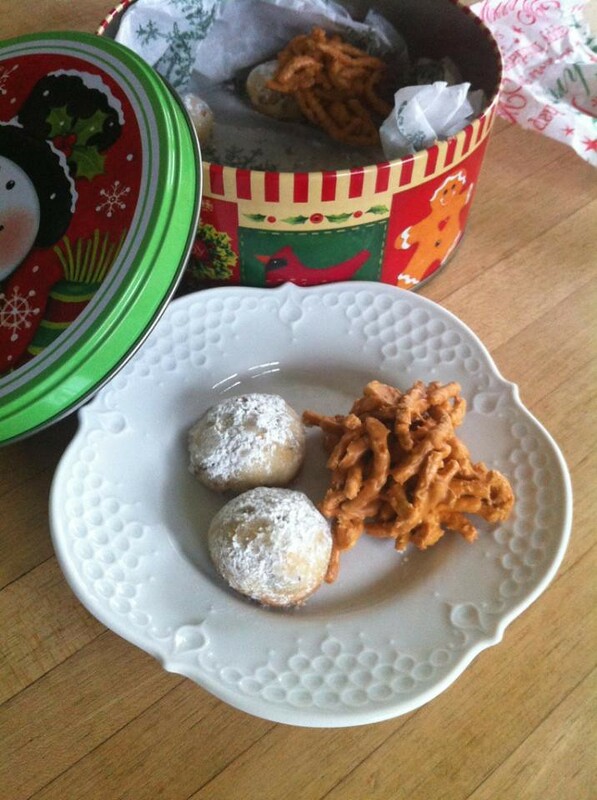 Sharon brought a minty, crunchy, chewy White Christmas Dream Drops, Shannon made to-die-for No-Bake Cornflake-Chocolate Pralines and Brown Butter and Sea Salt Chocolate Chip Cookies, and Vrylena made addictive Elsie’s Brown Sugar Cookies. They're all delicious! In a large mixing bowl, cream the butter. Add the vanilla extract, then gradually add the confectioners' sugar, beating until light and fluffy. Sift the flour, measure, and then sift again with the salt. Add gradually to the butter-sugar mixture and stir until incorporated. Add the nuts and stir until mixed. Scoop dough into 1-inch balls (about 1 heaping teaspoon) and place on a parchment-lined baking sheet, leaving 2 inches between cookies. Bake for 15-20 minutes, until edges are golden. Let cool for 5 minutes, then transfer to a cooling rack and dust with powdered sugar. Mix chow mein noodles and peanuts together in a large bowl. In a small sauce pot, combine peanut butter and butterscotch chips, and heat over medium-low heat while stirring, until melted. Pour butterscotch-peanut butter mixture over chow mein noodles and peanuts. Stir to combine. Use two spoons to scoop small piles of mix onto parchment or wax paper lined baking sheets. Let cool and then move to the refrigerator to chill completely.